As expected, top drivers always make the event. It’s certainly the case of the World Championship first round in Suzuka, which despite being amputated of 3 rounds, provided a superb Japanese opener thanks to its protagonists – Camponeschi, Sasaki, Tiene, and Forè, just to mention some. With such brilliant display of skill and excitement, the reasons that had the 2012 World Championship in peril are more than ever beyond us! 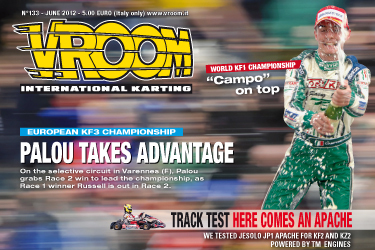 The CIK-FIA World Karting Championship, the most important event of the karting season, hits the headlines for better or for worse. Despite the politics that have put a strain on the event in the past few years - definitely the least edifying aspect of our sport – the opening round of the “Asian” World Championship held in Suzuka proves once again – as if it were necessary – that the media frenzy it creates, as well as the racing level on track, are second to none. Forget the exciting, nail-biting racing provided by the World Championship finals. The classic support event of the World Championship Asian rounds, the Asia-Pacific KF2 Championship, ran short of emotions in the three-day venue, which saw only 30 drivers taking on the grids in Suzuka. First Russell, then Palou, the first round of the European Championship highlighted few expected results and several surprises. Varennes, a difficult circuit, was once again extremely selective. Round 2 of the 2012 Rotax Max Euro Challenge held at the 1,275 metre ProKart Raceland circuit in Wackersdorf, Germany, was even more interesting when the leaders of the series found themselves challenged for the championship. The man needs no introduction, his name speaks for himself. 5-time World Champion Danilo Rossi engraved his name in karting first by winning as a driver, then as a team manager (with DR Racing Team set up in 1996) and lately as chassis manufacturer. The reach of his brand is truly global, just like his record of victories. Within the range of Jesola chassis we have the new Apache model, characterised by new concepts of making the most of flexion, especially the fore-carriage and the square supplementary tubes. We tested it at the historical track, with same name as brand, with the help of two official drivers Chiara Poletto and Massimo Mazzali, set up for KF2 and KZ2 both mounting TM engines. In Jesolo we tested the new PowerShift system that allows you to change gears on a 125cc kart with “paddles” like on all the major single seaters, and change at the same speed as professional drivers. As for technical learning and hence everything that explains the function and a better use of a very important accessory for kart racing, the carburettor, Vroom has published thousands over the past 24 years (yes, in 2013 it will be the 25° anniversary) with the intention of giving the driver the best set up solution at zero cost. S.O.S. KART – What are we taking to the track? How many times have we asked ourselves this question while we are getting ready to go to the track? As national racing calendars get busier and busier, regrettably we had to make a selection of what to publish this month - although we’d love to have enough space for every single race that takes place every month. We start with British SuperOne Rotax Series opener, unfortunately spoilt by bad weather. From France, we report on the brand new National Series Karting, the first championship to host Rotax, X30 and National classes alike on the same racing weekend. Some more Rotax racing from Denmark and Spain, while Portugal and Poland had a very successful opening round of the national championships. We move to the other side of the world, where the 2nd round of the CIK Stars of Karting series in Australia saw some new winners to spice up the championship. With all that racing going on, the news section is a bit more condensed this time around. We have a preview of the Coppa dei Campioni held in Jesolo (Italy) – the full report will be featuring in the July issue. Some technical novelties from the UK with Tal-Ko’s new 80cc engine, and the new exhaust from France’s D Racing. We also feature Sarno circuit new layout for the KZ World Cup. We close with July national and international racing calendar, featuring more than 50 national events from 21 countries around the world, as well as 5 international races.